In the hedgerow, right at the end of our property, mixed up in a holly bush and half-hidden behind a pile of tree prunings left by the previous owner, Gabrielle has discovered a medlar tree. So we read (in the July 2002 edition of Country Life magazine, amongst a pile handed on to us by our neighbour Carole) it’s an attractive tree with a gnarled shape, pretty spring blossom and lovely red and yellow autumn foliage. With that in mind, we’ll try and clear around it to expose it more to view. It’s an import to Europe but has been around for centuries and was, apparently, a common site in 16th century English gardens. 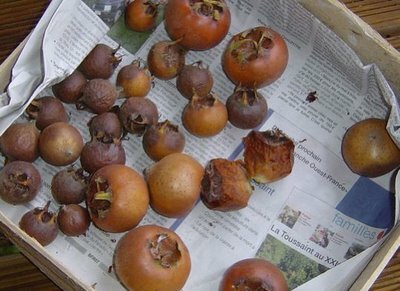 It’s a relative of the hawthorn and pear and has a fruit variously described as like a giant brown rosehip and a cross between a small russet apple and an oversize hawthorn haw. The biggest talking point is that, in order to eat it, you have to let it go rotten first! It’s a shame that doesn’t apply to more things, when I think of how many times in the past that I’ve bought fruit to put in the fruit bowl with all good healthy intentions, only to throw it, uneaten and rotting, in the compost a few weeks later. The fruits are picked in November, after the first frost but are solid as a lump of wood and therefore inedible. They need to be stored in a cool and dark space until they have gone half-rotten, a process known as “bletting”. The brown flesh can now be scraped out with teeth or a spoon and is a grainy paste with a hint of a prune taste to it. If that appeals to you, it can be eaten just like that, or cream and sugar added and they can also be baked whole as one does with apples, roasted with butter and cloves or made into a jelly that goes well with game (see also Food for Free by Richard Mabey, the foragers bible). Gabrielle had already discovered it but, when Paul was delivering the tree stumps for our Guy Fawkes bonfire (see 7th November blog) he told us about it (it being the time to harvest the medlar) and how he’d had to persuade the previous owner not to chop it down. He’s got a cultivated version with fruit twice the size (the photo above shows a mixture of our wild ones and Paul’s). When Gabrielle was round their farm later in the day, having coffee, Paul fetched some of his medlars, one of had already started to go rotten on the tree. Their daughter, Rosanne, demonstrated to Gabrielle that it was the rotten bit that needed to be eaten, something Gabrielle found very counter-intuitive! Way back on 19th July, I posted a blog on a visit to our woods by an expert forestier from the Centre Régional de la Propriété Forestière (CRPF). This department offer advice to the owners of woodlands on how best to manage them, what financial aid might be available and on any regulations applicable. They also administer the certification for sustainable wood, Programme Européen des Forêts Certifiées , which apparently is similar to FSC certification. One issue that was raised by Monsieur Girard was that if the original owner had had a state subsidy to plant, it could place restrictions on how the wood is managed, which would affect our own permaculture ambitions for the wood. I’ve recently had another expert forestier from a different department, the Direction Départementale de l'Agriculture et de la Forêt (DDAF). The DDAF have a more general role in agriculture and also act in a regulatory role, enforcing directions and legislation. They work cooperatively with the CRPF and, helpfully for me, both expert foresters know each other well. Considering he works for a state department, in a regulatory role, and our wood is comparatively so small, I was particularly impressed with how helpful and ecologically spot-on he was. He spent over two hours walking the wood with me, was very receptive to our permaculture ideas for managing the woods while also offering advice and a practical exercise in how to choose trees for keeping and the felling pattern for those surrounding them. He said that the original owner had received bad advice on what species to plant and no management at all had taken place since planting. The original file has disappeared and so the only restriction for us is that we can't cut all the trees down and change the use of the land, i.e., it must remain woodland. He suggested that we could possibly arrange a third meeting with both experts present and, in the meantime, I must come up with a management plan to discuss with them on site. The first part of this process is drawing a base map. Over such a large area, where the trees made it nigh on impossible to pace out distances in a straight line or visually join up different parts of it, this is one job (like all the base-mapping, in fact!) that I’d left. The not-particularly-ecological-easily-impressed-with-gadgets boy in me had thoughts of buying a GPS finder and plotting landmarks on a large sheet of squared paper but I received advice that the leisure models available for the money I was prepared to pay would be nowhere near accurate enough for mapping and would be further compromised by the tree canopy obscuring the sky and therefore satellite. This advice has saved me money, as when I started mapping, it all made sense rather quickly. The land used to be pasture separated by hedgerow with trees, the French term is bocage. These dividing trees are mainly beech, for some reason, and some of them remain and others that have been cut to the stump have re-grown coppice-fashion. These lines of old beech correspond to the numbered parcels marked on the carte cadastrale (land registry map). 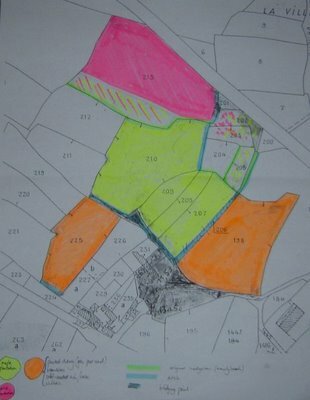 The previous owner has planted up whole parcels with single species, so it has been relatively easy to produce a helpful map, see photo above. We’re recovering from a superb bonfire night firework party. We introduced our French friends and neighbours to a very English fête. Two of our neighbours couldn’t get their heads around the fact that we’d be outside all evening and so concerned was Paul, neighbour and pig farmer, that he arrived in his huge green John Deere tractor with several huge lumps of tree trunk and stumps to add to the two van loads of non-recyclable pallets that I’d collected from him earlier, to ensure that the bonfire burnt all night and kept everyone warm. 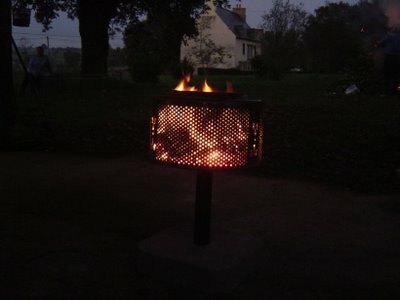 With a huge barbeque made from half of an old water cylinder filled with bricks, borrowed from Thierry and Beccy, and our washing-machine fire (see photo above and blog of 2nd September) everyone kept adequately warm all evening. 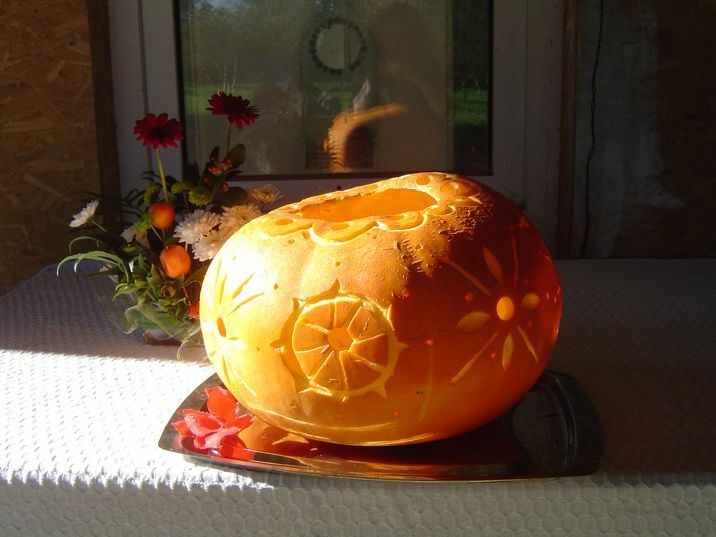 We served mulled wine, then pumpkin soup prepared according to a Delia Smith recipe using a huge pumpkin grown by Andre, who was very proud both of the soup, which was very tasty, and the hollowed out and carved pumpkin on display (photo above). This was followed by spare ribs marinated and prepared to a Hugh Fearnley Whittingstall recipe and finally an apple and walnut tart with walnuts from Caroline and apples from Carole. Alan then helped me let off a good selection of fireworks. It’s perhaps a measure of how well we’ve integrated here since April that we had fifty guests. It’s a lot different to my life in Brighton, which I enjoyed, but where I only spoke to the neighbours opposite and on either side, never had dinner with any of them and the relationship between the neighbours on one side and their neighbours on the other side developed into a battle over a loft extension and boundary that became so acrimonious it went to court and made the papers. We’ve changed country and moved from a lifetime living in towns and cities to the countryside, so I wouldn’t like to say which factors are at play. What I can say is that we have found a real community spirit here. “Peoplecare” is one of the ethics of permaculture. On my permaculture design course run by Patrick and Cathy Whitefield, the “peoplecare” and “living in communities” sections were my least favourite bits, which is no reflection on the course but rather on me. 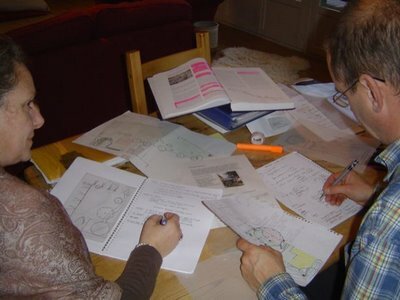 I thought it all a bit too hippy and fluffy and wanted hard practical details on how to do permaculture. The living in a community is probably one of the most important things for us now and adds to our efforts to permaculture our lives immeasurably; I think, for example, that Annike, our 70–something neighbour who’s never heard of the term could’ve probably written the book, and it’s fun to see the expression on our neighbours faces when they look at some of our permaculture experiments, like the no-dig potatoes under a straw and cardboard mulch. I’d stopped writing an update about our woods to watch the first of Hugh Fernley Whittingstall’s latest series, The River Cottage Treatment on the TV. (We have access to English TV here via satellite). It was excellent and compulsive viewing and so tonight’s blog will be about our chickens … again. For those of you who didn’t see it, this chef/food-journalist-become-organic-farmer/TV presenter is presenting a series during which he tries to change the minds of fast-food loving townies; this programme was specifically about chickens. His guests saw, at first hand, the difference between factory farms and his own free-range flock, learnt how to cook free-range alternatives to their own ready meal favourites such as chicken kiev, curried chicken and spicy chicken bites (no more expensive and no slower!) ending in the killing, preparing and eating of one of his own. 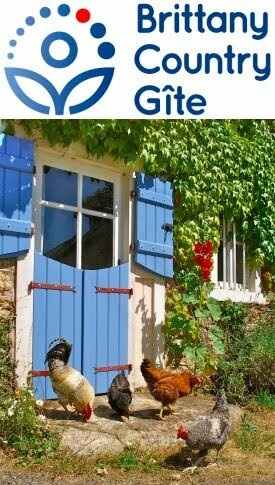 For a long time, I’ve thought that any chicken sold in a supermarket for just £2.50 (€3,60/$4.75) doesn’t leave much for the farmer but didn’t realise that the farmer sells them, on average, for just 3p (just over 4 centimes or 5 cents) per bird! Who’s winning here, certainly not the farmer or the chicken? We’re now into full egg production here and so we keep them in their run until around midday, as chickens usually lay in the morning. 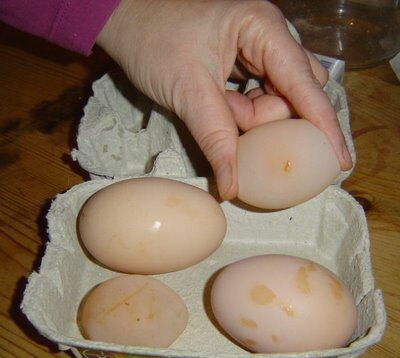 The eggs are still variable, from impressively large double-yolkers, through regular to some in soft bags rather than fully-formed shells (see photo above). When let out, the chickens roam far and wide, returning mid-afternoon when we feed them with wheat and maize. Three weeks ago, Caroline gave us another two chicks to add to our flock. We kept them in for a week to habituate them to their new home and whilst they were definitely at the bottom of the pecking order, they returned after their daily outings without any problems … until a couple of days ago. The smallest and cutest was missing! We’ve already lost one chicken recently, perhaps to a fox or dog, and were sorry to see another go. We searched around and spoke to neighbours, without success. It was a full 24 hours later when she turned up at feeding time with the rest of the flock, which made us both unreasonably happy, I must be getting soft. Chickens will scratch any restricted area bare over time, as ours have done with their run. They get access to fresh grass while they’re out but, as they’re spending a bit more time in during the mornings, we’ve added a thick layer of straw to their run which allows them to satisfy their scratching instincts whilst inside. The inspiration for this is the “Balfour method” of keeping chickens, as described by John Seymour in his The New Complete Guide to Self-Sufficiencyp120. In this method—suitable for a restricted space like a backyard—straw is spread in the pen as described above, with the rest of the space available for the chickens divided into two or three grassed runs with the chickens moved between them before the grass is scratched bare, thereby allowing the grass in the other pens to recover. On a personal note, my mum tells me that some friends of the family, who have been arable farmers for many years, have started reading our blog. So, Steven and Joan (and anybody else, for that matter) please feel free to offer advice: for instructions on how to post a comment, have a look at the blog for June 28th.